Breast cancer is the most frequently diagnosed cancer and the chief cause of cancer death among women worldwide, with an estimated 1.7 million cases and 521,900 deaths in 2012. Breast cancer alone accounts for 25% of all cancer cases and 15% of all cancer deaths among females.1Its high incidence has led to research on new diagnostic imaging techniques for early diagnosis and to improve patient’s mortality rate. Ophir et al raised the concept of ultrasound elastography in 1991.2 In 1997, the first clinical study was published showing the potential of elastography in the detection and characterization of breast lesions. The first practical diagnostic equipment was released in 2003. Breast ultrasound elastography is an emerging sonographic imaging technique which provides information on breast lesions in addition to conventional ultrasonography (US) and mammography. 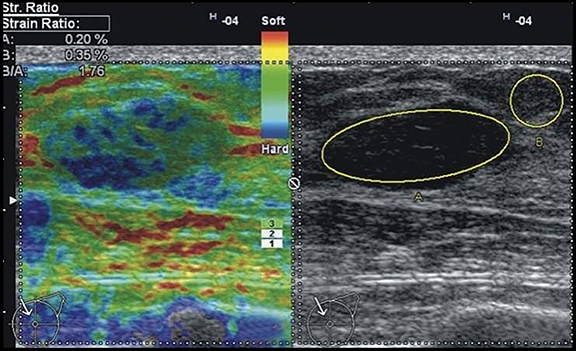 Ultrasound elastography provides a non-invasive evaluation of a the “stiffness” of a lesion. It increases the specificity of conventional B-mode ultrasound by more precise characterization of breast lesions.3 Recent studies show that ultrasonographic elastography (USE) provides higher diagnostic accuracy compared with conventional B-mode ultrasonography during breast cancer diagnosis, which eventually helps to reduce false-positive results (ie, increased specificity) and therefore is useful in avoiding breast biopsy. Ultrasound elastography has 86.5% sensitivity, 89.8% specificity, and 88.3% diagnostic accuracy in the differentiation of benign from malignant solid breast masses.3 Stavros et al4 reported 98% sensitivity, 68% specificity, and 99% negative predictive value using a classification model based on criteria which included lesion shape, orientation, margin, echogenicity, and acoustic transmission.Krouskop et al5 reported that fat, normal glandular tissue, fibrous tissue, ductal carcinoma in situ, and infiltrating ductal carcinoma of the breast had different elastic moduli at different strain levels. A recent study that was conducted by Amany et al6 differentiated benign and malignant breast lesions using different imaging modalities. Results of their study showed that combined B-mode ultrasound and elastography had 83.3% sensitivity, 88.1% specificity, 92.5% NPV, 75% PPV and diagnostic accuracy of 86.7% which is greater than conventional ultrasound alone. Another study by Tsai WC et al7found a sensitivity of 84% and specificity of 98%. The two most important characteristics in real-time ultrasound elastography imaging are size and stiffness of the lesion. Different ultrasound elastographic techniques have been introduced based on the types of force applied and are broadly classified into static and dynamic ultrasound elastography. Static ultrasound elastography includes strain imaging, while dynamic ultrasound elastography is divided into shear wave and acoustic radiation force impulse imaging (Figure 1). A comparison of strain and shear wave ultrasound elastography in differentiating benign and malignant breast lesions was done by Chang JM et al15and their results concluded that strain ultrasound elastography is more specific 93.7% and less sensitive 81.7%. While shear wave ultrasound elastography is more sensitive 95.8% and less specific 84.8% in differentiating benign from malignant breast lesions. In strain ultrasonographic elastography, tissue moves en route with transmission of ultrasonographic waves. Compression, applied mechanically, is the most commonly used method and includes compression by ultrasound transducer, manual longitudinal compression or by respiratory movements. It only provides qualitative assessment of tissue deformation and is obtained by calculating the difference in radiofrequency of the ultrasound beam before and after compression.16 The absolute value of the deformation along the longitudinal axis is proportional to the intensity of the compression exerted.The profile of tissue deformation is converted to an elastic modulus from which an image called an elastogram is derived. This technique is most widely used, as it does not require any specific software. However, it lacks quantitative assessment and is operator dependent. Acoustic radiation force impulse (ARFI) imaging is a new ultrasonic elasticity technology. Compared with static elastography, ARFI can yield highly reproducible information on the tissue stiffness of solid breast masses within and across observers.20--22It incorporates two different modes: Virtual Touch Tissue Quantification (VTQ) and Virtual Touch Tissue Imaging (VTI). VTQ is quantitative, tracks a shear wave in the region of interest (ROI) that travels perpendicular to the direction of the acoustic push pulse, and calculates the shear wave velocity (SWV, measured in m/s). The stiffer the tissue, the greater the SWV will be. VTI is qualitative, employing a short acoustic impulse of high intensity to deform the tissue elements in a defined ROI and creating a static map (ie, an elastogram) in grayscale of the relative stiffness of the tissues. The stiffer the tissue, the darker the mass area becomes.23 This technique has an advantage of less inter-observer variability, but it does pose the potential for artifacts. Different scoring systems, ratios and criteria have been proposed to differentiate breast lesions and characterize them as likely benign or malignant tissues. These are broadly classified into three categories of assessment, qualitative, quantitative and semi-quantitative. Score 5, entire lesion and surrounding area are stiff (Figure 6). According to this scoring system, the results for elasticity are considered negative (score 1), equivocal (scores 2–3) and positive (score 4–5) (Figure 7). Simple breast cysts usually demonstrate a particular artifact on black and white images called a “bull’s eye,” and on color-coded images an aliasing artifact, blue-green-red (BGR) pattern (Figure 8).24-26 Itoh et al3 demonstrated a sensitivity of 87%, specificity of 90% and diagnostic accuracy of 88%. Score 5, stiff tissue surrounding a non-deformable lesion. These scoring methods must always be incorporated into the ultrasound examination or mammogram, as they are not sensitive for determining the depth, diameter or volume of the lesion. This method expresses the elasticity of the lesion in units (kPa in shear wave or mm/s in ARFI). Lesions with soft elasticity are represented by dark blue and light blue and considered negative. Lesions with intermediate elasticity are represented by green and orange and considered equivocal. This assessment uses the strain ratio to compare the elasticity of the lesion to the surrounding normal parenchyma or fat in cases of breast lesions. Strain ratio (SR)—The ratio of average strain within the lesion compared to contiguous breast tissue. It represents the relative rigidity of the lesion. Malignant lesions have a higher strain ratio than benign lesions.35Studies have shown that SR is an extremely important factor differentiating malignant and benign breast lesions.36 Lesions are considered suspicious for malignancy with an SR of greater than 3.37 Zhi et al38 also found a critical value of 3.08. A study conducted by Gheonea IA et al39 also determined a mean SR of 2.08 for benign lesions and 6.28 for malignancy. 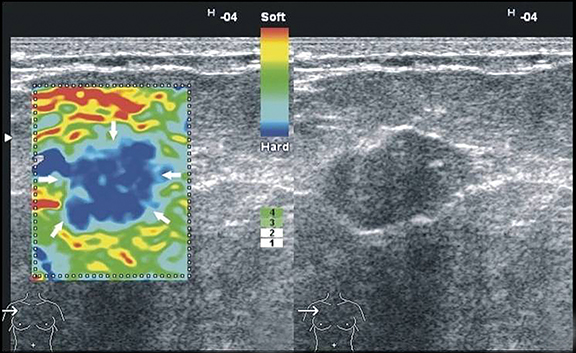 The addition of ultrasonographic elastographic features into the 5th edition of the BI-RADS lexicon provides an important tool to increase the specificity and diagnostic accuracy of ultrasonography of breast lesions.40 The lesions are first characterized according their shape, margins, orientation, vascularity, and echo pattern within a particular BI-RADS category. Then, these are classified as soft, intermediate, and hard according to the ultrasound elastographic criteria. Morphology is considered the most significant criterion in BI-RADS 4b, 4c, and 5 category lesions when malignancy is suspected. The final classification of the lesions according to BI-RADS assessment and elastographic findings are described in Figure 11. The BI-RADS characterization of the lesion on grayscale imaging can be modified according to the elastographic findings. 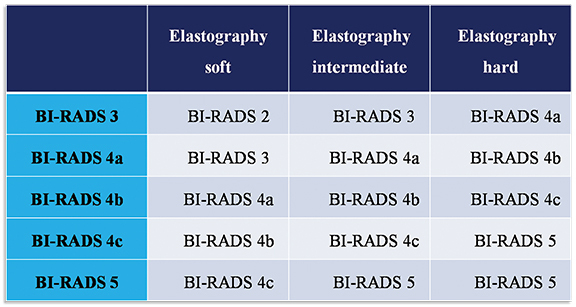 As it is depicted in the table that if the lesion is characterized as BI-RADS category 3 on grayscale ultrasound imaging and it appears soft on elastography, then BI-RADS 3 can be changed into a BI-RADS 2 examination. Similarly, if it appears hard on elastography then it will be changed to BI-RADS 4a and biopsy of the lesion should be advised to rule out malignancy. This approach therefore prevents unnecessary short term follow-up and also helps in early detection of tumors. Positive or negative ultrasound elastographic results influence B-mode ultrasound findings and BI-RADS categorization of breast lesions. This results in increased diagnostic confidence level in distinguishing lesions as benign and malignant, resulting in early and accurate diagnosis (Figure 12). These results also help in characterization of small incidental masses seen on screening breast ultrasound,detection of malignant axillary lymph nodes and subtle masses seen during targeted ultrasound following MRI. A well-defined, oval-shaped, circumscribed lesion with smooth margins has been characterized as BI-RADS category 3 lesion, which is typical for fibroadenomas. These lesions have less than a 2% chance of malignancy, and short interval follow-up for up to two years is recommended. If these lesions are soft on ultrasound elastography, then they can be labeled as BI-RADS category 2 (benign lesions), reducing unnecessary follow ups. Well-circumscribed malignant breast lesions can be misinterpreted on B-mode ultrasound and therefore misclassified as BI-RADS category 3 lesions, resulting in delayed diagnosis. Ultrasound elastography helps differentiate these lesions by hard elasticity representing malignant lesion and upgrading the BI-RADS to category 4, leading to histopathological correlation of the lesion.Improved identification of the more suspicious portion of a lesion helps direct an ultrsound-guided biopsy. Lesions with low suspicion of malignancy BI-RADS category 4a can be converted to BI-RADS category 3 depending upon the elasticity of lesion on ultrasound elastography. Different management strategies can be applied by radiologists. An aggressive approach with biopsy can be used for higher specificity or a conservative approach with short-interval follow up can be used to reduce false-negative results. Breast ultrasound elastography is a useful imaging modality resulting in increase specificity and sensitivity in diagnosing different breast lesions when combined with B-mode ultrasound findings. Although ultrasound elastography is easy to perform, appropriate knowledge regarding technical factors and interpretation of results is important for management. Our guiding principles should be helpful for applying breast ultrasound elastography to daily practice. Thanks for the support and encouragement given by the members of the department of radiology. Torre LA,Bray F,Siegel RL, et al. Global cancer statistics. 2012. CA Cancer J Clin. 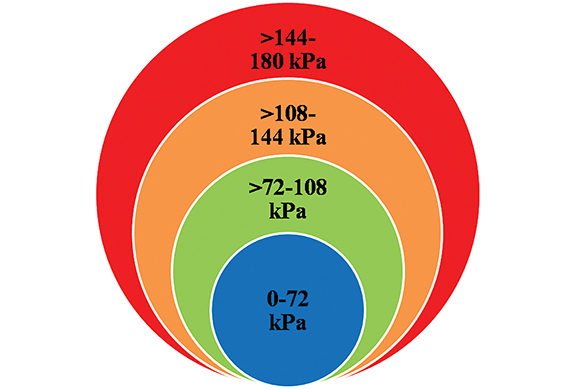 2015;65:(2):87-108. doi: 10.3322/caac.21262. Ophir J, Cespedes I, Ponnekanti H, et al. Elastography: a quantitative method for imaging the elasticity of biological tissues. Ultrasonic Imaging. 1991;13(2):111-134doi:10.1016/0161-7346(91)90079-W.
Itoh A, Ueno E, Tohno E, et al. 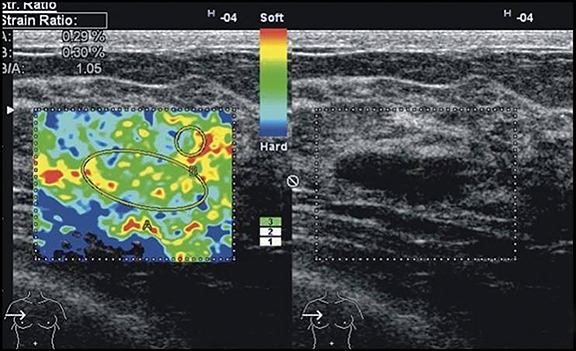 Breast disease: clinical application of US elastography for diagnosis. Radiology. 2006;239(2):341–350. Stavros AT, Thickman D, Rapp CL, et al. Solid breast nodules: use of sonography to distinguish between benign and malignant lesions. Radiology. 1995;196(1):123–134. Krouskop TA, Wheeler TM, Kallel F, et al. Elastic moduli of breast and prostate tissues under compression. Ultrason Imaging. 1998;20(4):260–274. Elkharbotly A, Farouk HM. Ultrasound elastography improves differentiation between benign and malignant breast lumps using B-mode ultrasound and color Doppler. Egyptian Journal of Radiology and Nuclear Medicine. 2015. 46;(4):1231–1239. Tsai WC, Lin CK, Wei HK, et al. Sonographic elastography improves the sensitivity and specificity of axilla sampling in breast cancer: a prospective study. Ultrasound Med Biol. 2013;39(6):941-949. Shiina T, Nitta N, Ueno E, et al. Real time tissue elasticity imaging using the combined autocorrelation method.J Med Ultrason.2002;29(3):119–128. Nightingale K, Soo M.S, Nightingale R, et al. Invivo demonstration of acoustic radiation force impulse (ARFI) imaging in the thyroid, abdomen, and breast. Ultrasonics symposium. 2001;2:1633–1638. Nightingale K, Soo M.S, Nightingale R, et al. Acoustic radiation force impulse imaging: remote palpation of the mechanical properties of tissue. Ultrasonics symposium. 2002;2:1821–1830. Meng W, Zhang G, Wu C, et al. Preliminary results of acoustic radiation force impulse (ARFI) ultrasound imaging of breast lesions.Ultrasound Med Biol. 2011;37(9):1436–1443. doi: 10.1016/j.ultrasmedbio.2011.05.022. Insana MF, Pellot-Barakat C, Sridhar M, et al. Viscoelastic imaging of breast tumor microenvironment with ultrasound. J Mammary Gland Biol Neoplasia. 2004;9(4):393-404. Barr R.G, Destounis S, Lackey L.B, et al. Evaluation of breast lesions using sonographic elasticity imaging: a multicenter trial.J Ultrasound Med. 2012;31(2):281–287. Pallwein L, Mitterberger M.J, Struve P, et al. Comparison of sonoelastography guided biopsy with systematic biopsy: impact on prostate cancer detection.EurRadiol. 2007;17(9):2278–2285. Chang JM,Won JK,Lee KB, et al. Comparison of shear-wave and strain ultrasound elastography in the differentiation of benign and malignant breast lesions. AJR Am J Roentgenol. 2013;201(2)347-356. Ophir J, Céspedes I, Ponnekanti H, et al. Elastography: a quantitative method for imaging the elasticity of biological tissues.Ultrason Imaging. 1991;13(2):111-134. Bercoff J, Tanter M, Fink M. Supersonic shear imaging: a new technique for soft tissue elasticity mapping. IEEE Trans UltrasonFerroelectrFreq Control. 2004;51:396–409. Fink M, Tanter M. Multiwave imaging and super resolution.Phys Today. 2010;63(2):28–33. Evans A, Whelehan P, Thomson K, et al. Quantitative shear wave ultrasound elastography: initial experience in solid breast masses. Breast Cancer Res. 2010;12(6):R104. Balleyguier C, Ciolovan L, Ammari S, et al. Breast elastography: the technical process and its applications.DiagnInterv Imaging. 2013;94(5):503-513. Tozaki M, Isobe S, Sakamoto M. Combination of elastography and tissue quantification using the acoustic radiation force impulse (ARFI) technology for differential diagnosis of breast masses. Jpn J Radiol. 2012;30(8):659–670. Bai M, Du L, Gu J, et al. Virtual Touch tissue quantification using acoustic radiation force impulse technology: initial clinical experience with solid breast masses. J Ultrasound Med. 2012;31:(2):289–294. Goddi A, Bonardi M, Alessi S. Breast elastography: a literature review. J Ultrasound. 2012;15:(3):192–198. Kim MY, Cho N, Yi A, et al. Sonoelastography in distinguishing benign from malignant complex breast mass and making the decision to biopsy. Korean J Radiol. 2013;14(4):559–567. doi:10.3348/kjr.2013.14.4.559. Cho N, Moon WK, Chang JM, et al. 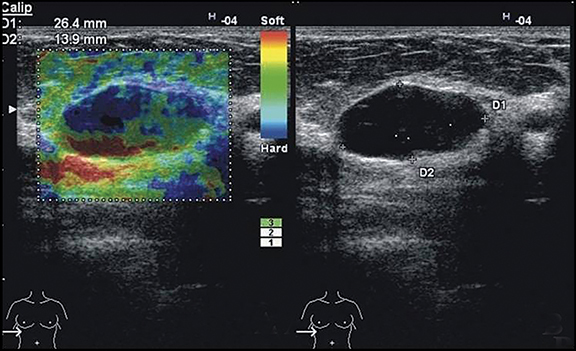 Aliasing artifact depicted on ultrasound (US)-elastography for breast cystic lesions mimicking solid masses. ActaRadiol. 2011;52(1):3–7. doi: 10.1258/ar.2010.100116. Barr RG. Sonographic breast elastography: a primer. J Ultrasound Med. 2012;31(5):773–783. Rizzatto G, Aiani L, Baldassarre S, et al. Characterization of breast lesions with real-time sonoelastography: results from the Italian multicenter clinical trial. 2006. Abstract-RSNA. Chicago, USA. Berg WA, Cosgrove DO, Dore CJ, et al. Shear-wave elastography improves the specificity of breast US: the BE1 multinational study of 939 masses. Radiology. 2012;262(2):435–449. doi: 10.1148/radiol.11110640. Lee SH, Cho N, Chang JM, et al. Two view versus single-view shear-wave elastography: comparison of observer performance in differentiating benign from malignant breast masses. Radiology. 2013. Lee SH, Moon WK, Cho N, et al. Shear-wave elastographic features of breast cancers: comparison with mechanical elasticity and histopathologic characteristics. Invest Radiol. 2014;49(3):147-155. Tozaki M., Fukuma E. Pattern classification of shear wave elastography images for differential diagnosis between benign and malignant solid breast masses.ActaRa diol.2011;52(10):1069–1075. doi: 10.1258/ar.2011.110276. Tozaki M, Isobe S, Fukuma E. Preliminary study of ultrasonographic tissue quantification of the breast using the acoustic radiation force impulse (ARFI) technology.Eur J Radiol. 2011;80(2):182–187. Meng W, Zhang G, Wu C, et al. Preliminary results of acoustic radiation force impulse (ARFI) ultrasound imaging of breast lesions.Ultrasound Med Biol. 2011;37(9):1436–1443. Bai M, Du L, Gu J, et al. 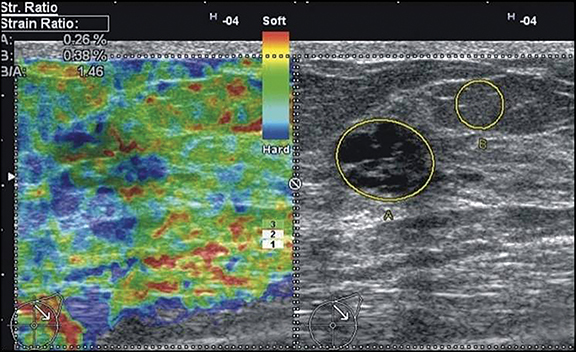 Virtual touch tissue quantification using acoustic radiation force impulse technology: initial clinical experience with solid breast masses.J Ultrasound Med. 2012;31(2):289–294. Barr RG. Shear wave imaging of the breast: still on the learning curve.J Ultrasound Med. 2012;31:347–350. DOI: 10.7863/jum.2012.31. 3.347. Zhao QL, Ruan LT, Zhang H, et al. Diagnosis of solid breast lesions by elastography 5-point score and strain ratio method.Eur J Radiol. 2012;81(11): 3245-3249. Wang Z, Yang T, Wu Z, et al. Correlation between elastography score and strain rate ratio in breast small tumor.Zhong Nan Da XueXueBao Yi Xue Ban. Journal of Central South University Medical Sciences. 2010;35:(9):928–932. Zhi H, Xiao XY, Yang HY, et al. 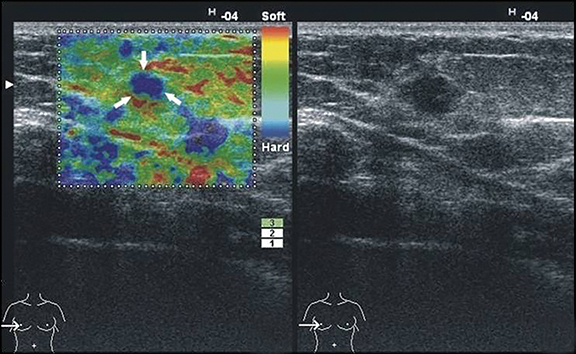 Semi-quantitating stiffness of breast solid lesions in ultrasonic elastography. AcadRadiol. 2008;15:1347–1353. doi:10.3969/j.issn.2095-3941.2012.02.008. Ioana AG,Zoia S, Simona B . Differential diagnosis of breast lesions using ultrasound elastography. Indian J Radiol Imaging. 2011;21(4):301–305. Fleury EF. 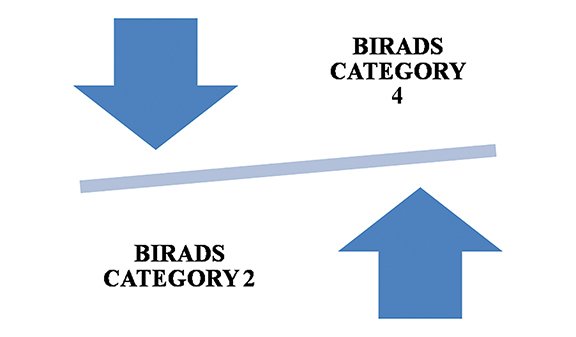 The importance of breast elastography added to the BI-RADS (5th edition) lexicon classification. Rev Assoc Med Bras. 2015;61(4):313-316. Imtiaz S. Breast elastography: A new paradigm in diagnostic breast imaging. Appl Radiol. 2018;47(3):14-19. Dr. Imtiaz is a Consultant Radiologist in the Department of Radiology, Dr. Ziauddin University Hospital, Karachi, Pakistan.